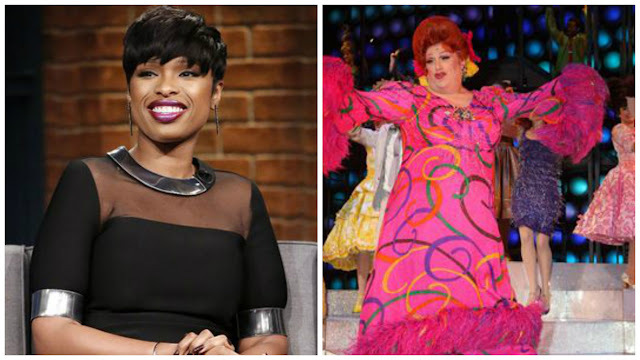 Quirky NY Chick: Jennifer Hudson and Harvey Fierstein To Star in NBC's "Hairspray Live!" Jennifer Hudson and Harvey Fierstein To Star in NBC's "Hairspray Live!" Jennifer Hudson & Harvey Fierstein will star in Hairspray Live! on NBC, December 7. Photos courtesy of NBC/Universal. It was announced yesterday that award winning performers Jennifer Hudson and Harvey Fierstein will headline the cast of NBC's Hairspray Live!. The show, produced by Universal Television, will broadcast from Los Angeles on Wednesday, December 7 at 8PM ET/PT. Harvey Fierstein who will play Edna Turnbald, the role he created on Broadway and won a Tony for, is also writing the teleplay. Jennifer Hudson will play Motormouth Maybelle.